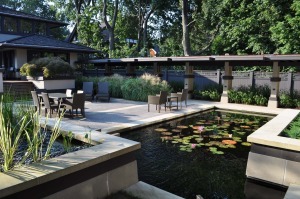 BAYER LANDSCAPE ARCHITECTURE has completed work on the rehabilitation of Frank Lloyd Wright’s Edward E. Boynton House, located in the EAST AVENUE PRESERVATION DISTRICT in Rochester, New York. The Cosentino-Parker Trust purchased the home in 2009 with the mission of fully restoring and preserving the treasured structure and rehabilitating the site. The owners have a long and successful history of significant historic rehabilitations and restorations, and the Boynton House has become their greatest passion. The house was completed in 1908 and originally included more than 2 acres of gardens. Subsequent owners subdivided the property in the 1920s, severely compromising Wright’s vision for the house as it related to the landscape. The preservation treatments include rehabilitated gardens and site work that re-envision elements of the 1908 Boynton House landscape on the smaller site. The Trust and the project team approached the project with great care, adhering to the highest standards of quality and craftsmanship, and are staying true to Wright’s vision for the property, despite its present day constraints. The design team and contractors on the site have been meticulous in cataloging, identifying and photographing materials and components of the house as they were reviewed and reconstructed. The design team, which includes Bero Architecture, has a longstanding passion for preservation projects, architectural design, and for Wright’s work in particular.